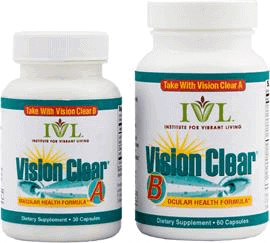 Vision Clear TM is a completely natural supplementthat has been developed on scientific principles to improve your eyesight. Is it a given thing of nature that you are bound to have reduced eyesight by the time you are 40? Not necessarily. There may be the possibility that, due to oxidative stress, your nerve tissues, optic blood vessels, and retinal cells have weakened. But not everything is lost, as you could still limit the damage to your eyesight and, moreover, bring it back to normal. Wipe out eye strain and unclear vision and get relief from irritated or dry eyes. Stop all macular degeneration related to age. Treat general oxidation damage taking place to your vision. Improve the microcirculation of retinal tissue. Protect your eyesight from the harmful ultraviolet rays of sunlight. Put off the beginning as well as growth of cataracts. Get relief from vision-related headaches. Permanently maintain razor-sharp and clear eyesight. Improve your eyesight naturally. Vision Clear offers a unique formula offers high potency anti-oxidants, omega-3 fish oil, alpha-lipoid acid, and other power eye nutrients in a two-step supplement for better eye health. Medical research has shown that you can overcome this free-radical attack on your eyes by regularly having an intake of high-potency bioavailable anti-oxidants like those that are present in the two-part Vision Clear A & B formula. With A & B together, you are getting the best possible nutritional back-up for the all-round health of your eyes for life. This is the only formula that gives you so many benefits for so little. Might help in preventing Macular Degeneration (AMD), which is generally considered untreatable, with effects like visual haziness, shadows or other aberrations in the center of your vision. Might help in preventing cataracts, which cause the eye lens to thicken, gradually becoming opaque or hazy, and is one of the leading reasons for blindness throughout the world. Might help in preventing glaucoma, another dangerous eye disease that results in high intraocular pressure that damages the retina and finally destroys the optic nerve. Might be effective in preventing the formation of bags under your eyes. Bloodshot eyes, Bitot’s spots, dry eyes, floaters, hazy vision, eyestrain, and many other allegedly untreatable and debilitating eye conditions.